There's enough air for everyone. The most important course. A man was not a scuba diver - he has become one. The training level will allow you to dive down to 18 meters with a partner anywhere in the world. The training program will provide your theoretical and practical training for real diving. Training is conducted according to international EN and ISO standards. The e-textbook is at free access. You will receive an electronic certificate for the smartphone immediately after completing the course. The plastic certificate will be promptly delivered to you by mail. High level of training. Strict quality control. All this is the NDL Diver course. The purpose of nonprofessional diving is human safety, comfort and health. The NDL Diver course is the first step in the underwater world. This most important step should be as safe as possible. Knowledge is the basis of security. At the theoretical part of the course you will receive necessary and sufficient information on physics, special physiology, organizational measures and equipment so that your diving is as safe and comfortable as possible. You will have the opportunity to control the organization and execution of the underwater travelling in terms of the most up-to-date rules of the security technology. The first lesson: pressure changes under water. Basis of buoyancy. Equipment for diving. The second lesson: Physical features of the aquatic environment. Additional equipment for scuba diving. The system of partnership under water. The third lesson: high-pressure air breathing. The fourth lesson: table of no-decompression diving. Dive-computers. The fifth lesson: organization and planning of diving. Coordination of joint actions. Types of underwater bottom. Potentially dangerous sea animals. At the practical part of the training, the skills of solving all possible emergency situations that may arise underwater, the skills of buoyancy control and the use of scuba gear are developed. Training is divided into classes in closed and open waters. In a closed water body, a scuba diver develops skills of scuba management and solving possible problems. In an open water body, he demonstrates them in real conditions. At the very first lesson, among other skills, you will learn how to breathe under water, clean the mask from water and help a partner in need of air. At the second lesson, you will master the basic skills of economical movement under water, buoyancy control using special equipment. The third lesson is aimed at solving a number of problems that theoretically may arise with the equipment. The basis of the fourth session is the rules and sequence of a controlled and safe emerging from deep water. At the fifth lesson, you have already the possibility of self-navigation and begin to learn the skills of helping a partner in the event of problems with his equipment or in the absence of his control of air supply. The sixth lesson is dedicated to a number of skills to solve possible problems in weightlessness. The main feature of the NDL Diver course is its proximity to real conditions. Teaching methods are created and adapted in such a way that any person can learn to dive, regardless of his/her gender and age. There is no person who cannot be a diver. There are people who have not completed the course yet. Knowledge is the foundation of responsibility. The theory of the course contains the basics of physics of the aquatic environment and special physiology, information on organizational measures and general principles of the equipment operation. Thus, you get the opportunity to assess the process of training and real diving by the employees of this industry (instructors, dive-guides). The guarantee of the human security can be due to the organizer’s professionalism and the client’s control only. You are a diver from the first minute of the lesson. At the practical classes of the course, the emphasis is on performing exercises in real conditions in a state of neutral buoyancy. Comfort and safety of a scuba diver is achieved by the skills of controlling this equipment, matrixed into muscle memory, and perfect actions in conditions of emergency or any rapidly changing stressful situation. All possible emergency situations are known, so are the solutions. You will receive all skills of solving problems underwater at the practical classes of this course. This approach to training allows the NDL instructors to invite you to the world of diving and to state that this type of tourism is as safe as possible. You can refresh the theoretical part of the course by entering the appropriate section of the NDL website for free and reading the e-textbook thereof. World experience at your service. The NDL programs have international EN and ISO certification. The NDL Diver training level corresponds to the international standard EN 14153-2 / ISO 24801-2 "Autonomous Diver". This suggests that the scheme of your training in theory and practice meets the highest international standards. Upon completion of training, you will receive the Diver Certificate in electronic and plastic form. 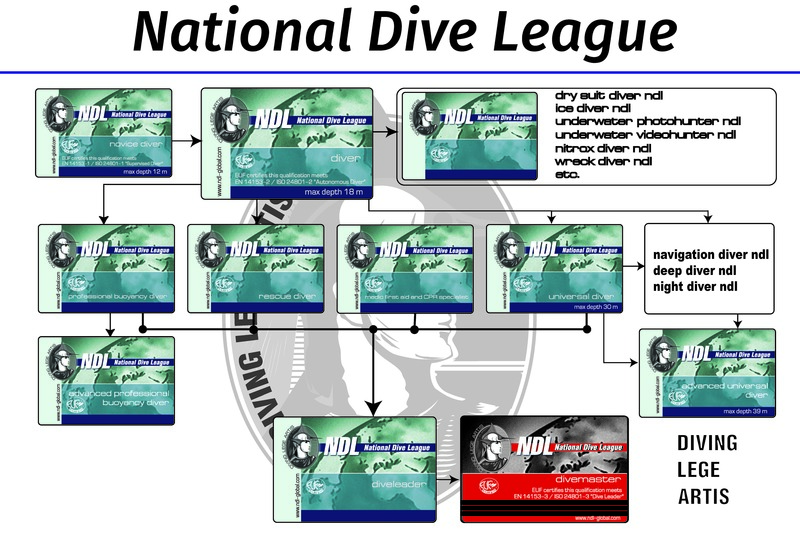 On the NDL site, you will be entered into the international database of divers. In case you have forgotten the certificate at home, the confirmation can be found directly on the NDL website. For people planning to dive under the mandatory supervision of a professional, a unique NDL Novice Diver course is created, which lacks a number of skills that provide an autonomous swimming without the supervision of an instructor or other professional. The NDL Novice Diver course differs from the NDL Diver course in one block of lessons. In the future, if you decide to improve your skills, you can complete the NDL Diver course program by receiving additional training from a certified NDL instructor. The NDL Novice Diver course complies with the international standard EN 14153-1 / ISO 24802-1 "Supervised Diver" . Start today - completion in the sea. In the case, if there is no possibility of training in open waters at the moment, you can learn the NDL Confined Water Diver program. In the future, at the first opportunity, you can complete the NDL Diver course in the open water body. You can master buoyancy at the professional level at the NDL Professional Buoyancy Diver course. You can learn underwater photo or video, navigating by compass and natural landmarks. You can learn the skills of diving in the dark and the technique of deep diving. You can learn to take responsibility and provide assistance to a distressed scuba diver at the NDL Medic First Aid and NDL Rescue Diver courses. And much, much more up to becoming a professional and making this exciting occupation as your job.